In spite of all the barriers being broken in Jimmy Carter’s numerous intimate moments shared as a child with his African-American brothers and sisters in Christ, close neighbors and family friends, a barrier still remained. Blacks and whites could not share from the same cup for a simple cool drink of water. I’m a bit of an icon hunter. I enjoy searching for icons of the faith that speak in profound ways to our relationship with God and with each other as brothers and sisters in Christ. As I prayed through and reflected upon the fourth chapter of the gospel of Saint John this week, I couldn’t help but think about the icon that’s on the screen today. 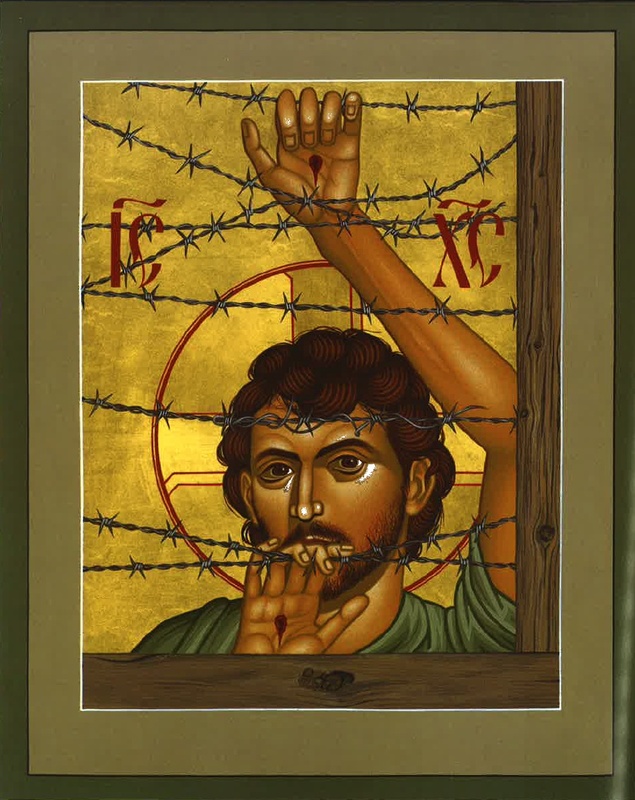 This is a modern icon created in 2002 by Brother Robert Lentz. It is called Christ of Maryknoll. The artist’s vision in the icon is to lift up the ministry of the Maryknoll priests, brothers, sisters, and lay people who have been imprisoned in China and elsewhere for their work among the poor, the broken, the oppressed. In our worship together today, there is a daring and dangerous conversation taking place at a well. And this isn’t just any old well, this is Jacob’s well. A significant location in the history of God’s people and God’s story. And this isn’t just any old conversation either. This is a conversation between a woman and a man. And to make it even more complicated, it’s a Samaritan woman and a Jewish man. Both are crossing barriers. And I argue that both are seeking to quench thirst. Thirst is quenched as a result of their conversation, a conversation which happens to be one of the longest conversations between two people in any of the four Gospels. A thirst quenched as the result of a barrier that stood between Jews and Samaritans for centuries. A barbed-wire fence that’s being torn down in a most unlikely encounter between Jesus and a loved child of God who everyone thinks is on the wrong side of the fence. And for two more days, Jesus stayed with them. Jews and Samaritans, drinking from the same cup. There is a Mercedes-Benz television commercial from 1991 that shows several Mercedes colliding into concrete walls during safety tests. An interviewer is asking one of Mercedes’ engineers about their energy-absorbing car body and the technology that they have recently patented in this area. The Mercedes’ design is one of the most sophisticated designs in the history of automobile manufacturing. It is also one that has been copied by almost every other car manufacturer since. Take a look at the commercial and note what the engineer says about why they have never enforced the patent they hold on this technology. Did you catch that? The engineer said, “There are some things in life that are too important not to share.”? Isn’t that a great statement for who we are, or are supposed to live as people who follow Jesus? The living water that we receive in the life, death, and resurrection of our savior Jesus is just too important not to share, isn’t it? Too important to not invite others to join us in this journey. Too important to not reach out to another person on the other side of the fence with a life giving drink from the well of living water. Too important. But too often, I’m not sure we even know or are willing to admit that we’re thirsty? In your life in Christ, what are some things that clutter your mind or rest heavy on your heart? What is causing your thirst? For the Samaritan woman at the well, it was everything she had ever done. And by sharing with others the conversation she had with Jesus, her life and the community in which she lived was changed forever. It was just too significant and important of an experience not to share with someone. Brothers and sisters in Christ, every one of us here today is thirsty. In this holy season of Lent, you and I are being invited to stop for a few minutes at the well and drink deeply from the living water of God’s love. Drink deeply children of God, you are loved. And in our life together in Christ, that’s something too important not to share. Amen. This entry was posted on Sunday, March 23rd, 2014 at 11:52 pm	and posted in Recent Sermons. You can follow any responses to this entry through the RSS 2.0 feed.